Pakistan and visiting US special representative Zalmay Khalilzad on Thursday agreed that ultimately the intra-Afghan dialogue would be vital to agree upon the contours of a future Afghan polity where Afghanistan becomes a stable and prosperous country and at peace with its neighbours. US Special Representative for Afghan Reconciliation Ambassador Zalmay Khalilzad held a delegation-level meeting with Foreign Secretary Tehmina Janjua to discuss developments in the Afghan reconciliation process. He was accompanied by an interagency delegation representing departments of defence, state and the National Security Council. The foreign secretary was assisted by senior officials from the ministries of Foreign Affairs And Defence. It was noted during the meeting that taking the Afghan peace process forward remained a shared responsibility. Ambassador Khalilzad briefed the Pakistan side on his recent engagements in the region. He lauded Pakistan’s efforts in facilitating direct talks between Taliban and the US in Abu Dhabi last month. The foreign secretary reiterated Pakistan’s commitment to facilitate Afghan reconciliation process to realize the shared goal of peace and stability in the region. This is Ambassador Khalilzad’s fifth trip to the region. He is set to call on Foreign Minister Shah Mehmood Qureshi on Friday (today). Meanwhile, a delegation led by Zalmay Khalilzad and including US Commander for Afghanistan General Austin Scott Miller met Chief of Army Staff General Qamar Javed Bajwa at the General Headquarters in Rawalpindi, according to a statement issued by the Inter-Services Public Relations (ISPR). Matters pertaining to regional security and the Afghan peace and reconciliation process were discussed between the two sides. 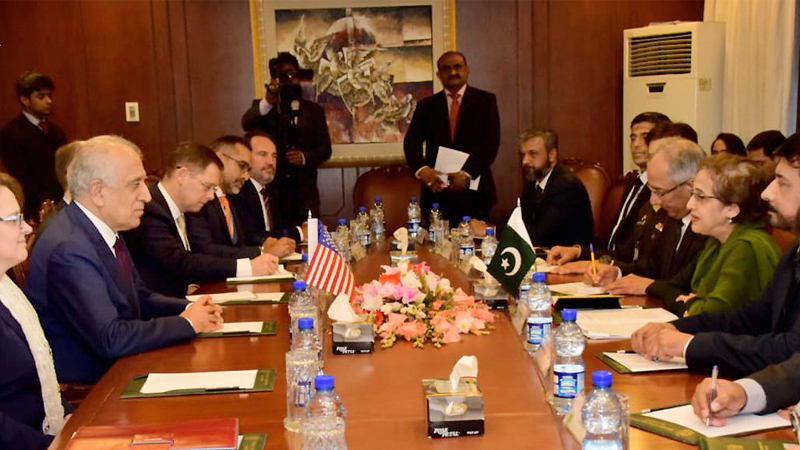 The US delegation appreciated Pakistan’s efforts towards the peace process, said the military’s media wing. General Bajwa reiterated the importance Pakistan gives to peace in Afghanistan and provided assurances that efforts to bring peace and stability in the region will continue on the part of Pakistan. Deputy Assistant to US President and Senior Director for South and Central Asia Lisa Curtis and US charge d’affaires to Pakistan were also present.